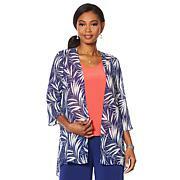 The blouse is beautiful with soft material yet made large. Easy and packable. This tunic will give you endless style and wear all season long. Top it over your favorite staples for seamless elegance. 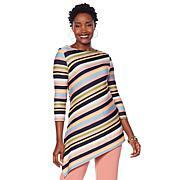 Slinky Brand 3/4-Sleeve Shimmer Angle Hem Tunic Time to mix up your hemlines! The diagonal cut makes the perfect complement to skinny jeans or leggings, and the side slit brings movement to the mix. It's a great basic piece that provides a wonderful backdrop for accessories.